Addition of retroreflective strips on stop sign posts may be beneficial when additional attention needs to be drawn to a stop sign. Additional reflective material on stop sign post (Neal Hawkins/Institute for Transportation). 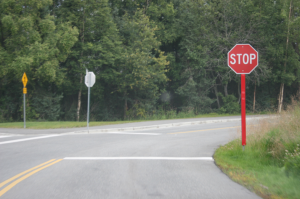 Addition of retroreflective strips on stop sign posts may be beneficial when additional attention needs to be drawn to a stop sign. This may be particularly true at night (Atkinson et al. 2014). Use of additional reflective material is covered in the Manual on Uniform Traffic Control Devices (MUTCD) (FHWA 2009) under Section 2A.21 Posts and Mountings. According to the MUTCD, retroreflective strips should be at least two inches in width and placed the full length of the support from the sign to within two feet above the edge of the roadway. The color should match the background color of the sign. Fitzpatrick et al. (2011) investigated evaluated a single intersection where reflective strips on the stop sign were added. The crash rate three years before use of the reflective strips was 0.06 crashes per month and 0 crashes per month in the three-year period after the improvement. Fitzpatrick, Kay, Susan Chrysler, Srinivasa Sunkari, Joel Cooper, Hyung-Jung Park, and Laura Higgins. Modern Traffic Control Devices to Improve Safety at Rural Intersections. Report 0-6462-1. Texas Department of Transportation, 2011.